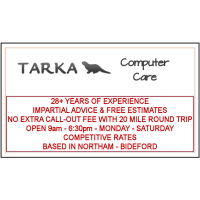 Tarka Computer Care is a business based in Northam, Bideford specialising in helping home and small business users with their PC, server, laptop and tablet repairs, maintenance and other related issues. Run by Paul, an I.T. consultant with 29+ years experience in the industry, we are able to fix most computer issues and also offer various other services depending on your requirements. Excellent level of work, advice and support. Really impressed, and really relieved to find someone close by who I can trust to do an excellent job, in a impressively quick time scale. Paul went beyond my expectations and fixed my dinasaur of a computer, with lots of easy to understand recommendations to keep the computer running smoothly. He is a God send to our internet based business, and we will be definitely using him again. After mum-in-law's computer failed to boot up - and I feared the worst on hearing the hard drive's 'click of death' - she called a few local repair shops to see if it was worth fixing. Paul replaced the hard drive, added a couple of extra GBs of memory, rescued all her photographs and files, removed all the nasties (plenty Trojans...), and reloaded all of her programs, her desktop settings - EVERYTHING - back on to the new drive. And at a genuinely modest cost and charging for only 2 hours of labour! Result - 'Nan' has a whizzzing computer (like new), and we all have Tarka Computers pencilled in to our phonebooks as the place to call for PC issues. A bust harddrive can be a complete nightmare, but was made completely painless by Paul's efficient work. Excellent, friendly, efficient and fast. I would certainly go back to Paul with any problems or queries in the future and would not hesitate to recommend him. Extremely helpful from the initial phone call right through to getting my Laptop repaired. Paul sorted it all out the same day could not recommend enough. Paul's availability and knowledge is impressive. I am very happy with the service I received. I will definitely use Paul again if (when) the need arises.